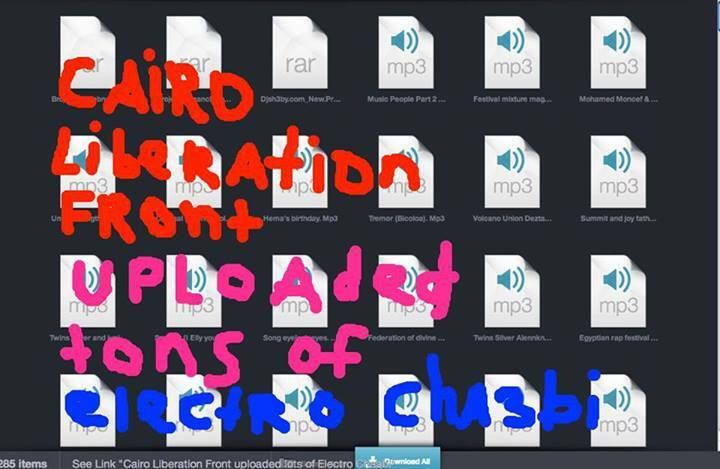 In an exciting move, Cairo Liberation Front, the Dutch Electro Chaabi DJ group have just uploaded four gigs (yes, you read that right, 4 GIGS) of the Chaabi madness that they collected from Egypt.Which is obviously fantastic, because unless you've recently traveled to Egypt (or spend some serious time in the Arabic language sections of Youtube), a lot of this music has been pretty much inaccessible. As we've noted before, we're pretty big fans of Electro Chaabi, the post-revolutionary electronic music that's been tearing up Cairo for the past couple of years. Both a compelling expression of the political frustrations of Egyptian youth and a fun, brain-tickling recreation of traditional wedding music, we've featured it extensively on our programs and blog ever since it's distressed square-waves first floated into our aural zone. In an attempt to infect everyone with the same enthusiasm that we have for Chaabi, we’re announcing The Afropop Electro Chaabi Mix Competition. Download, explore, and select the best tunes from CLF’s mega-upload and assemble them into a top-flight mix, and we’ll post your mix on our site, mail you an AWPP shirt, and send a telepathic high-five your way. Do it for the glory. Do it for the t-shirt. But as always (and forever), do it for Georges Collinet.